The Bibby Scientific range of heating blocks have been developed in conjunction with DrySyn to provide the best possible solution for heating round bottom flasks. Combined with the Bibby Scientific range of undergrad hotplates and hotplate stirrers, the Bibby Scientific heating blocks provide the cleanest and safest method for synthesis for single of multiple reactions, whilst giving equal or better heating performance than silicon oil. 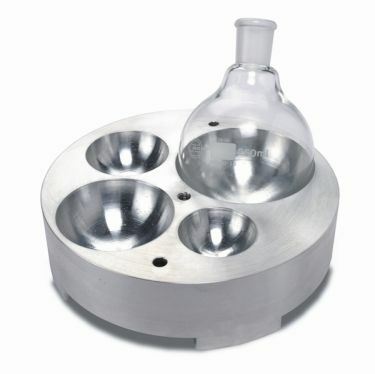 The modular nature of the Bibby Scientific heating block system gives you the greatest degree of flexibility, two sizes of base plates are available to accommodate up to three blocks each, SHB100BASE can take blocks for up to 100ml flasks while the SHB250BASE accepts blocks for up to 250ml flasks. Handy cost saving starter kits are also available, combining the base plate with a selection of blocks to get you up and running. All block sizes are also available separately in packs of three. For larger volume reactions a third base plate is available, the SHB1000BASE accepts a single insert for up to 500ml and also includes heat resistant handles for safe and easy lifting. The high quality anodised blocks offer excellent chemical and solvent resistance, and the low well has been proven to offer excellent temperature transfer without compromising your view of the reaction or risking cracking the glassware. The low well also ensures that the blocks are compatible with multi neck flasks. The Bibby Scientific Undergrad hotplates are provided with an integrated fitment for a standard retort rod, this combined with the three position accessory clamp provides the most effective way of securely holding multiple flasks simultaneously. Accessory clamps are available in two sizes to offer the best fit for both base plate sizes. Bibby Scientific heating blocks are compatible with the undergrad range of hotplates, and each block includes a probe hole to house the Bibby Scientific SCT1 temperature controller probe, allowing accurate control of the block temperature whilst on the Bibby Scientific hotplate. The modular nature of the Bibby Scientific heating block system gives you the greatest degree of flexibility, two sizes of base plates are available to accommodate up to three blocks each, SHB100BASE can take blocks for up to 100ml flasks while the SHB250BASE accepts blocks for up to 250ml flasks. SHB100KIT9 - Bibby Scientific heating blocks kit: including flat base plate SHB100BASE and (3 x 25ml SHB25ML), (3 x 50ml SHB50ML) and (3 x 100ml SHB100ML) inserts. SHB250KIT6 - Bibby Scientific heating blocks kit: including flat base SHB250BASE (3x250ml SHB250ML) and (3x100ml SHB100ML) inserts. SHB1000KIT - Bibby Scientific large heating blocks kit: including 1000ml flat base and 4 adapters for 50ml, 100ml, 250ml and 500ml.